Which is worse: a light-colored suit or mom jeans? 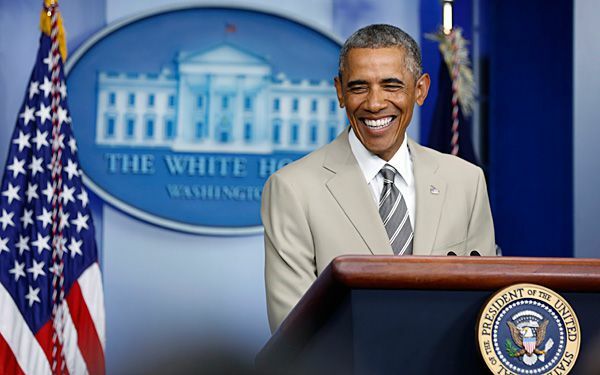 Tongues are wagging over President Barack Obama's audacity to wear a tan suit. The sight of Obama discussing possible U.S. military action in Syria in a light-colored suit lit up Twitter on Thursday, and the reviews of his unusual fashion choice were less than fashionable. Many tweets poked fun at slogans that are closely associated with Obama. "Taupe and change," says one tweet. "The audacity of taupe," says another, tweaking the title of one of Obama's best-selling books. "Yes, we tan," says a third. Gallows humor even came into play, with one tweeter suggesting the death penalty for whoever chose the suit for Obama to wear. Obama typically wears dark suits. In 2009, he was panned for wearing "mom jeans" to throw the first pitch at the All-Star Game. Critical thinking challenge: What does Tongues are wagging mean? This little dogs got the moves! I think it shouldn't matter what he wears. Its not your clothes, so let him wear what he wants to wear. People should mind their own business, it shouldn't matter at all that he's wearing what he wants. It means people are gossiping about it and I think race doesn't matter, because any shape, color, race, religion, or beauty; everyone is different. People have feelings no matter how much you think they don't. Just be nice, or at least, do not be racist. That is complete racism. I think this is not right because who cares about the President's fashion. Especially when he is giving a speech. People should not judge the President's fashion like they do not judge ordinary people's fashion. I do not understand why people are judging Obama's fashion. Who cares? I don't care. If no one cares about other people's fashion, then why would people be judging the President's fashion. It does not make any sense at all. Answer: "Tongues are wagging" means that people are making fun of someone or something just because they did something unusual like Obama wearing a light-colored suit. Does it really matter what you're wearing when discussing politics? I mean sure, he isn't very fashionable, but other 40 year old men are probably wearing mom jeans too! I believe it is exceptionally rude to make fun of his tan suit. Poking fun, that is slightly okay, but don't full on and make fun of him. A suit is a suit. Does it really matter what color it is? Would you like it if someone made fun of you for wearing something you may like? Let that sink in. It's just a suit. and momma jeans? that's okay. it is just his style. I think it was very weird to talk about something that is not personal to you on a website. Why did those people on twitter talk about Barack Obama's clothes? I am very and precisely amazed that three people in twitter talk about Barack Obama. I do not agree that Barack Obama wore the light colored clothes instead of dark clothes. Maybe I will not believe in this article in my whole life. The saying tongues are wagging mean that everybody is talking about something. So in this article everybody was talking about his light color suit. Its almost like gossip because when people talk about something or someone. This article is hilarious but at the same time it is not a good thing to make-fun of the President. I think that our society today is so used to laughing at everyone and and they don't understand that they are bullying and could really hurt someone someday. I predict that soon our country will be so used to making-fun of everything, that it could really become a big issue. Making-fun of the President is not a good thing and in my opinion rude and disrespectful. This is a big thing and it is not funny to be mean and rude to the leader of our country.